The Sea Dogs will wear specially designed BB-8 jerseys in game one of the doubleheader. The game-worn, autographed jerseys will be auctioned off to benefit Make-A-Wish Maine. Several Star Wars characters will be at the ballpark to meet fans and pose for photos, thanks to the 501st New England Garrison and the Mandalorian Mercs Wampa Clan. R2-D2 will also be making a special appearance at the ballpark, thanks to Paul's R2-D2. 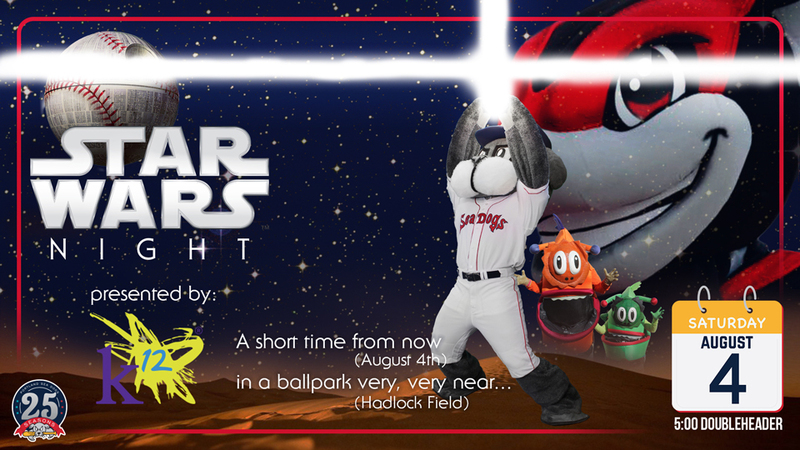 All fans are encouraged to come dressed as their favorite Star Wars character and participate in a Star Wars parade around the field. The parade will take place between games of the doubleheader. Prizes will be awarded for best adult and child costumes. The night will include Star Wars themed promotions including BB-8 racing, Star Wars trivia, and much more. Tickets are available at www.seadogs.com or by calling the Sea Dogs Ticket Office at 207-879-9500.